Gentle Readers, Frequent contributor Christine Stewart recently took a trip to England. Here are some of her impressions. For fabulous images, click on her blog, Embarking on a Course of Study. It’s a funny thing to visit an object used, worn, or created by people you admire, whether historical, literary, political, or religious figures. There’s an immense satisfaction in standing in its presence. I had been to the Morgan Library in NYC for the exhibit of Austen letters, but there was something about her desk. It was an everyday object that had been important to her writing life. She used it to write amazing novels that outlive and outsell those of her contemporaries. And I had worked very hard to get there! I arrived in London just before noon from Reykjavik, where I’d been attending the wedding of a friend, ready to officially begin my Jane Austen Pilgrimage. I had a couple of suitcases and decided to go to the flat of my friend’s new husband to drop them off before venturing out further. So, after getting up at 4 a.m to catch the shuttle to the flybus to the airport, then a plane, three trains, and one cab later (the cab driver called me ‘Luv,’ awesome), I dropped off all my bags and went out again. I then got caught up in taking pictures of the very charming streets as I walked down to the tube station. That, coupled with the train to King’s Cross/St. Pancras, the tube stop near the British Library, took up another hour, so I arrived after 4:00 p.m. and had to let go of my plan to also go to the British Museum as there just wasn’t enough time before they closed. Oh well, onward! The British Library was easy to find – it’s basically next door to St. Pancras (see the picture, is that an amazing building or what? It’s also a hotel). Once inside the Library I had a difficult time navigating the floor plan. 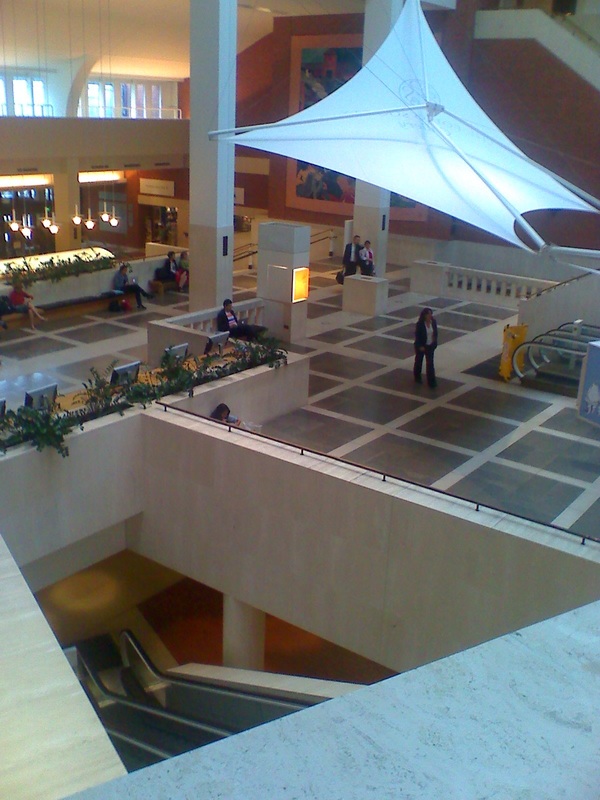 There are several levels to the front lobby, perhaps I should say landings, and then other floor levels themselves off of the lobby, which are not clear via the map. Perhaps the fact that there is a lower ground, upper ground, and ground floor before you even get to floors 1, 2, and 3 and they are not full levels beneath one another or all reached by one flight of stairs or set of elevators that is the problem! Eventually I located the Sir John Ritblat Gallery where the Library’s ‘treasures’ are, including Jane’s desk. Unless you know exactly which room the desk is in and what it looks like, and how deceptive the word ‘desk’ is, you will have just as much trouble, so let me tell you exactly what to do. This cheap pamphlet was aimed at young working men interested in sport, gambling and drinking. It amied to cover criminal cant, sporting slan and ‘flash phrased now in vogue’. 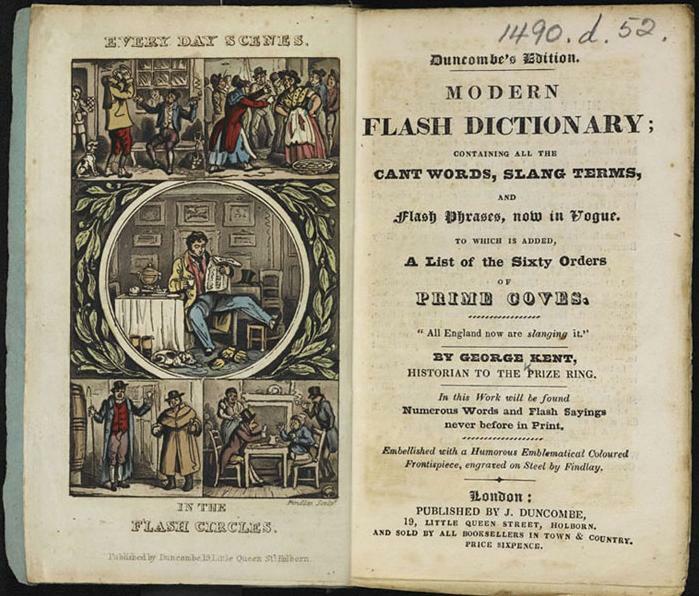 In the19th century, the word flash had several meanings. A fashionable man-about-town was commonly referred to as a flash cove and the meaning survives today in the phrase ‘flash Harry’. The dictuionary includes figures we would recognise, including fencers and shoplifters and unfamiliar terms, such as ‘priggers’ (pickpockets and ‘spicers’ (highwaymen). – George Kent, Modern Flash Dictionary. London, 1835. Listen to David Crystal, language expert, explore aspects of the evolution of the English language in this podcast.